Visit Our Store and Check out our Tutorials! Welcome to the Crafter's Companion USA Christmas blog hop! We are so excited to be giving away so many of Crafter's Companion's fabulous products, as well as sharing many Christmas project ideas. If you are coming from Ann's Blog, you are in the right place. If not, make sure you head over to Crafter’s Companion USA over here, where the blog hop starts. The inspiration I made for this blog hop is a Hand Painted Christmas Gift Bag and Candle. I used the Ivy Stamps from the Sheena Douglas Christmas Collection. Instead of painting it with Acrylic paints, I experimented using the new Spectrum Noir Markers. Don't you love the end result?? I love it! I enjoyed making this inspiration project. I am going to paint more candles to use as Christmas gifts. You should give it a try because these markers are amazing. I used the Masking and Painting/Stamping on Candle techniques for my inspiration projects. 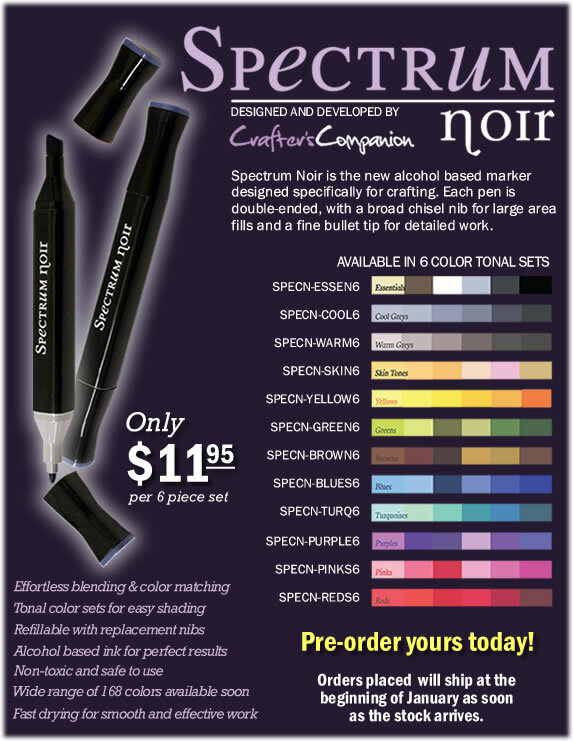 We are giving away a prize on every blog, including the entire set of our new Spectrum Noir alcohol markers to one lucky winner who posts a comment on every blog. These markers are so new, that you will be receiving our first prototype of them. That's 72 markers! Spectrum Noir pens are alcohol ink based which have been designed specifically for crafters, but these affordable markers are also great for beginners, students and hobby artists alike. Each pen is double-ended, with a broad chisel nib for large area fills and a fine bullet tip for detailed work. 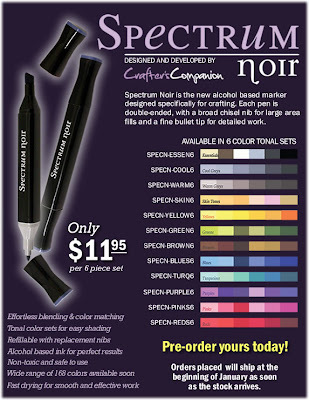 Spectrum Noir marker pens will soon be available in 168 colour shades including a colourless blender. The colours blend seamlessly and can be mixed or layered over each other. These fast drying, alcohol based markers are acid-free and non-toxic, and the coloured ends of the pen allow for easy colour identification. (Please note: The design of the pen, color names and numbers may be different than the pens that will be released in January.) The image colour has been reproduced as accurately as possible. I hope you were inspired by my project today and try your hand at creating your own Christmas Gift Bags and Hand Painted Candles. I am giving away the Humphrey stamps of your choice to one lucky random commenter. Just comment before Sunday, December 11th at midnight for your chance to win. All the winners' names will be posted at Crafter's Companion USA News blog on Tueday December 13th. (Must be a U.S. resident to win). PS. When leaving a comment, please mention what Humphrey Stamp you would like to have as a prize. Please don't forget to include your email too. You can check the stamps here. 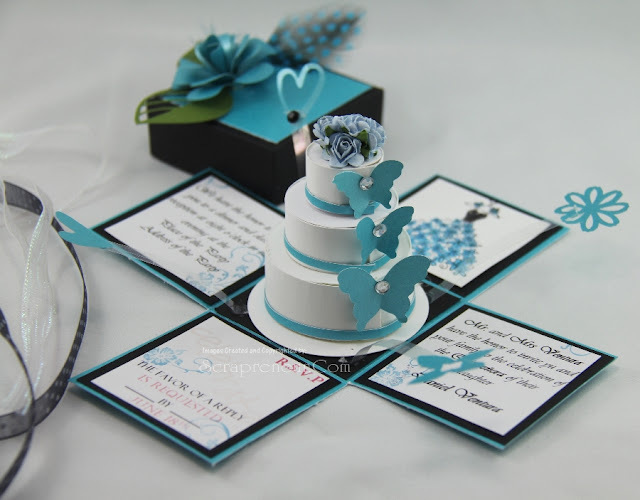 Your next stop is the talented Lisette of Totally Inspired. Love your Bag and Candle! Favorite Humphrey Stamps..."Hugs to You"
Lovely bag and candle! I will have to try the candle painting technique! My favorite Humphrey stamp is 'flowers to you'. I love seeing all your projects, so much inspiration!! The bag and candle look adorable, thanks for sharing and happy holidays! I absolutely love all of your ideas. I have subscribed to your blog for some time now and have learned so much. The Humphrey stamp that makes me smile is the Birthday Conga stamp. I can just see every one lining up and having a great time. hanks very sweet project jinky! thanks for the inspiration. Wow I need to try this out.All your projects are great. Gorgeous bag! I think my favorite Humphrey stamp is Friends Forever! Jinky, your projects are wonderful. You always inspire me! Very cute bag. Love the painting. Great idea! I think Santa's little helper stamp is the cutest! beautiful bag and candle! I like the Christmas Humprey Stamps. That is a great candle and bag!! I kinda like the Father's Day set. Love tGorgeous gift! Love the beautiful coloring. The markers are amazing. I like the Christmas Wishes set. Very cute and great sentiments. TFS! what a great idea and gorgeous bag. I love feed the birds and let it snow!!! What a beautiful gift idea for anyone on your Christmas list! My favorite Humphrey stamp set is baby's 1st Christmas. 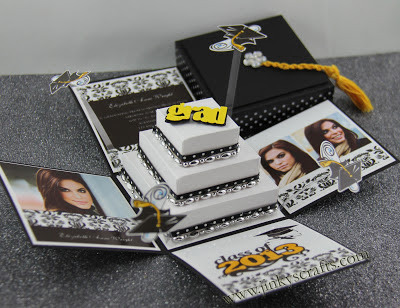 I'd love to win "Chocolate Box" stamp set. I just love Humphrey! 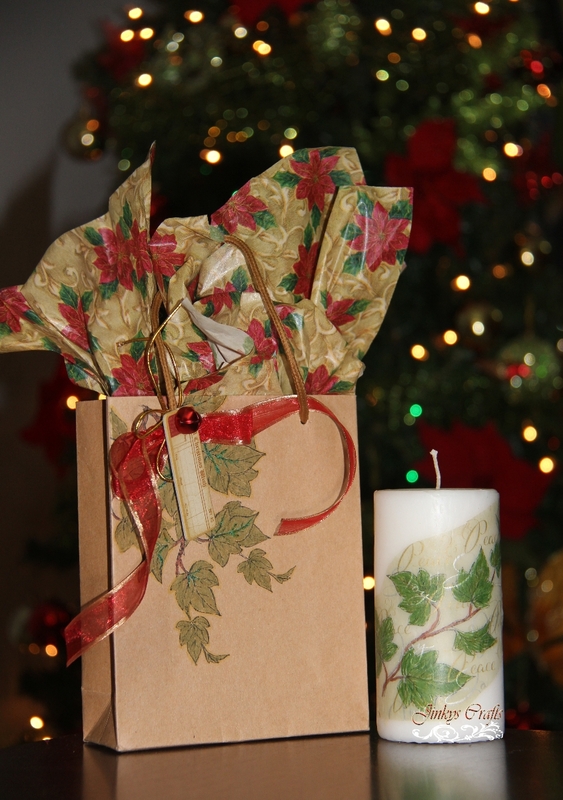 Love your projects.The gift bage is great and the candle is over the top. what a gorgeous gift!! love the flow of your design on the candle and bag! Love the Christmas angles Hymphreys. Nice looking bag and candle set. You did a great job. The stamp set I would like is Snow Fun. Fantastic idea! Love them both! Gorgeous coloring! Junky this is gorgeous. Great job. I'd like any of the Humphrey stamps since they're all so cute and I don't have any of them. My favorite is probably the first Christmas one. Thanks for the chance to win! I love your holly candle and gift bag ~ so pretty! Jinky, I really dig your gift bag and candle designs! What an awesome idea - very creative. Take care and STAY PSOTIIVE! Beautiful project. Love the look of the ivy and the coloring. My favorite Stamp is Hello Rudolf. Thanks for a chance to win an amazing set of markers and all the inspiration thruout. Beautiful, the gift bag looks so elegant. I like the Hello Rudolph set. What an impressive gift idea! The Christmas Wishes & Feed the Birds are my favorites because they are not just for the holidays. Hi Jinky - I love that candle! Great gift for someone! I love the first set of Humphrey stamps - mailing the card, etc. Wonderful projects, Wow amazing candle, love that!!! And a matching gift bag, you are very creative! Thanks for the chance to win a cute stamp set! Hopping along! gorgeous bag and candle! I like the Feed the birds set best! What a lovely project with bag and candle.My favorite new set is "feed the Birds", as it is great for all winter long. Thanks for the hop! ;What a great set you have here; just the perfect gift for the holidays:0) All the stamps are just way cute; Loving Let it Snow the most though; way cute and versatile! Hello Rudolf - love this stamp line and the candle turned out great with the markers ! Beautiful gift candle and gift bag! Great as always, I love seeing the projects you come up with. I would have to say Snow Fun is my fav set. Thoroughly enjoyed your artistic craft work. Very beautifully designed creations. Being and author I love the concept of impressing your loved ones with such vibrant and peculiar gift articles. Loved the formations of the candles as well. Thank you for this mesmerizing post and will be interested in many more like these. 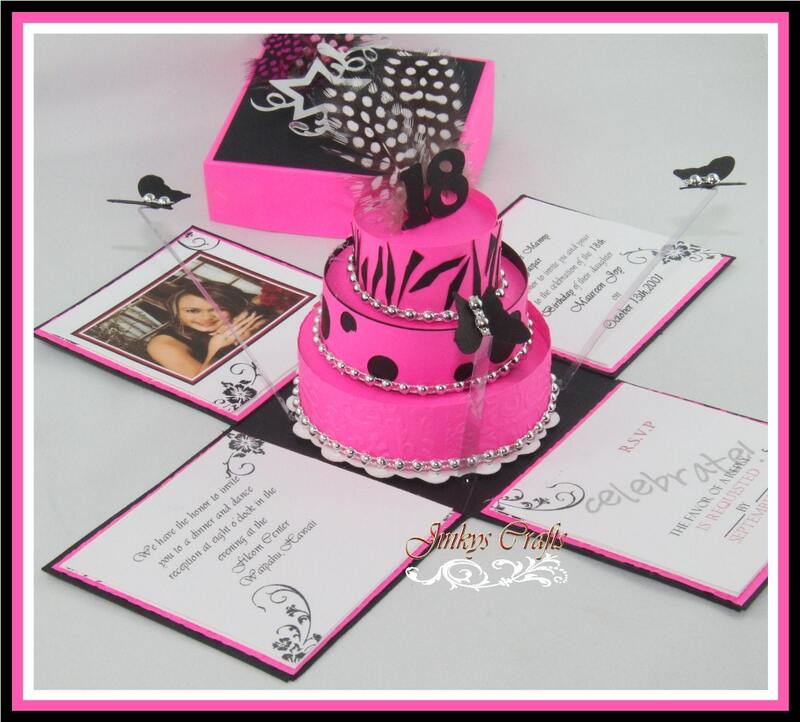 Hi welcome to my Jinky's Crafts & Designs blog. Please check our About Us to know me better.